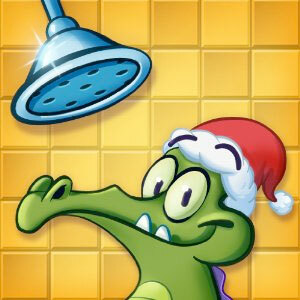 All poor Swampy the Alligator wants to do is take a refreshing shower in his lair beneath the city. Is that so wrong? Unfortunately, his water supply has been blocked by a variety of pesky obstacles. Your job is to carve a path that will deliver Swampy the precious liquid he needs in the entertaining Disney game Where's My Water? Where's My Water? is a challenging, physics-based game complete with multi-touch controls, detailed animated graphics, and a lively soundtrack. Prepare for hours of addictive fun as you strive to help Swampy bathe while collecting his beloved rubber duckies and other special items along the way. The entertaining story of Swampy the Alligator unfolds as you play. He's cute, he's funny, and he seriously needs a bath. But the subterranean world is conspiring against him: algae, toxic ooze, triggers, and traps are all waiting to divert the water and snuff out his innocent duckies. He needs your help! Your finger acts as a power shovel in this game--just swipe the screen and blaze a trail through the muck and grime. Swipe, slosh, and splash to guide the water through increasingly challenging scenarios and into Swampy's pipe. Unlike most gators, our hero hates to get dirty. To clean up right, Swampy will need soap, shampoo, loofahs, and more. Collect Swampy's grooming items to unlock bonus levels. Gather all the rubber duckies on each level and tap around to locate more surprises. Earn nearly 30 achievements and score bonus points based on your time, ducks collected, and water overflows. Wade your way through hundreds of levels divided into themed chapters, including Troubled Waters, Under Pressure, Sink or Swim, Change Is Good, and Boiling Point. Every drop counts in Where's My Water?, a refreshing puzzler filled with good, clean gaming fun. Check out Stretched Thin, the newest chapter in the story of Swampy where water balloons have made their way into Swampy's neighborhood. Solve these new puzzles by clearing a path for them to unlock new collectibles. Timing is everything--tap to pop the balloons to release the water at the right moment.